Did I mention I wouldn’t update regularly? You may have thought I’d given up by now – over a month without an update – but despite seeing such incredible similar indie projects as Infinity Universe (well worth checking out for the crazy scale – over 7 years of dev! and multitude of tech posts), and Salvation Prophecy (also awesome, and actually released), I’m still working on the game. Granted, I haven’t done as much as I would have liked, but then I never do. Seeing the great projects linked above has filled me with amazement for how much one person can do, as well as depressed me by showing me how much I have left to learn. So I’ll try and keep the scope of this game pretty low, as I don’t want to be working on it forever! I also started watching the first season of Firefly, which I’m loving, but can’t believe how Mr Whedon stole half my ideas before I’d had them! Seriously though, that is almost exactly how I’d pictured the state of civilisation in my far-fetched fantasies about this game. learned some of Zbrush 4R2 and figured out a new, better modelling workflow (along with 3ds max), which I’ll put up a video of in the future. It’ll be useful for any 3d modelling project, really, not just games. Did some spaceships with it. Improvised and recorded a sum of around 10 minutes of guitar “music” for the game – who’d have thought your skills degenerate so much after a year of not playing? Tried out FL Studio. Messed around a bit with Ogre, read articles/book on game programming, a bit of C++. 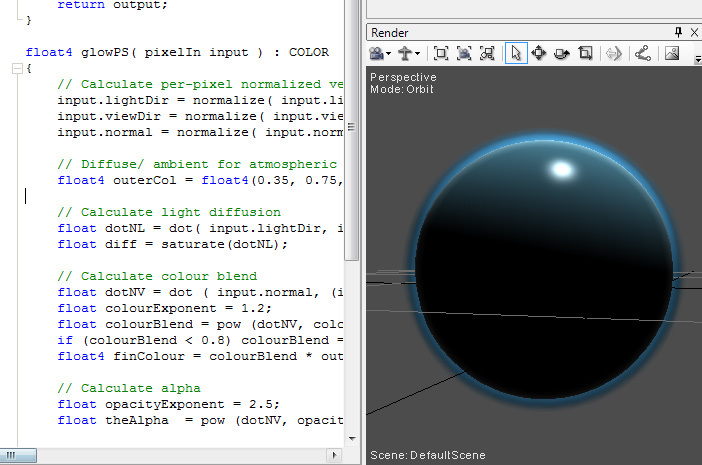 A 2-pass planet-y shader. Quite simple, I suppose; the atmosphere pass expands the vertices along their normals, and then colours using a “falloff” like pattern (if you’re used to max’s material system), and there’s a basic blinn shader as pass 2. Unfortunately the way I implemented the atmosphere (writing colour without depth) means it doesn’t work in Ogre when I ported it over. But I knew I’d have to re-write it anyway! I want to figure out a way of doing procedural noise-based planet textures – I’m pretty sure you can do lots of the work on the GPU. It seems everywhere I go for this sort of thing, this guy pops up as being a colleague of the writer: Inigo Quilez. I first came across him about a year ago; he seems to be a total genius having read the majority of his stuff! Ok that’s enough for now. If you want any detail that I might be able to provide, don’t hesitate to ask.